There were times when it would have been understandable if Matt Moulson questioned if he'd ever have a career at the NHL level. But old-fashioned hard work and a new outlook on the game have solidified his standing as a bona fide big-league player. At the end of the 2008-09 NHL season, Moulson, who hails from Mississauga, Ontario, had skated in a grand total of 29 games, all as a member of the Los Angeles Kings. The former 236th overall selection of the Pittsburgh Penguins found himself at a crossroads in his hockey career. A proven scorer, Moulson worked overtime to make a name for himself with the Kings. But it failed to pan out for Moulson in California. After making the team out of training camp three years ago, the forward was subsequently sent down to the Kings' American Hockey League affiliate, the Manchester Monarchs. If that wasn't tough enough, two weeks later, a sprained knee sent him to the sidelines and left him pondering his NHL future. “If I had to pinpoint the toughest point in my career, that would be it,” said Moulson, who recently spoke with NHLPA.com. “I had made the Kings out of training camp and I had high hopes. I didn't have a great start to the season and I was battling confidence issues, I guess. 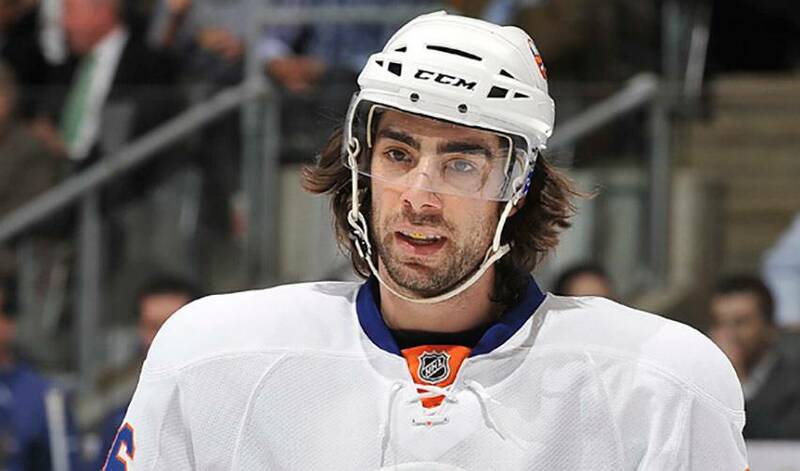 As an unrestricted free agent, Moulson looked elsewhere to kick-start his career. He signed a one-year contract with the New York Islanders on July 1, 2009. There were little guarantees that it would pan out for Moulson. But his fortunes would soon change. Moulson met a man by the name of Ben Prentiss, a strength and conditioning coach who has been working with professional and Olympic hockey players for over 12 years. His training system, which encompasses speed, strength, power, agility, along with body composition and nutrition, was just the tonic Moulson needed. Moulson hasn't forgotten what Prentiss told him early on in their friendship. It turns out, Moulson should have dreamed a little bigger. He was the Isles' leading scorer in preseason and made the team out of camp as a linemate of rising young star John Tavares. Moulson scored his first NHL hat trick - a natural hat trick - on December 3, 2009 against the Atlanta Thrashers. At season's end, he had scored 30 goals. This year, he's zeroing in on the 30-goal mark once again, skating alongside Tavares, the Isles' first overall selection in 2009. It's obvious team brass like what they see in Moulson. On January 27, 2011, he signed a three-year contract extension with the Islanders. All that's missing for Moulson, who married last year, is a chance to play for the Stanley Cup. While it appears the Islanders will be on the outside looking in when the playoffs start, Moulson sees good things in the near future for the Eastern Division team. Moulson will certainly play a major role in seeing that vision come to fruition. Perhaps the same can be said of Moulson himself, a player who has, without a doubt, shown he belongs in the big leagues. Maybe over the summer he'll consider telling Prentiss his target for the 2011-12 season is to hit the 50-goal mark. Sometimes, that's just what a good career move can do. The times when Shannon and Matt Moulson shared the same ice have long since passed, but their love of hockey and unwavering support of one another remains as strong as ever. While July 1st can be a time of stress for unrestricted free agents, Matt Moulson maintained his sense of humour and managed to find a familiar home. What made Lee a difference maker on and off the ice? Former coach Jeff Jackson offers up his thoughts in this week’s edition of My Top 5! Before he went on to have a distinguished career wearing the maple leaf, a young Jordan Eberle got his first taste of what national pride meant while playing hockey in the Yukon.